Full Israeli breakfast and dinner daily. Drive to Mount of Olives for a panoramic view of the city. Visit the Church of All Nations, King David’s Tomb and the Room of the Last Supper on Mt. Zion. Enter the Old City; walk through the Cardo, the ancient roman road; visit the Jewish and Christian quarters; view the Temple Mount; walk along the Via Dolorosa and the oriental Bazaar to visit the Church of the Holy Sepulchre. Next, drive to the Garden Tomb and enjoy the beautiful gardens and peaceful ambiance. Drive to Ein Karem to visit the Church of Visitation. Proceed to Yad Vashem, the memorial to the Holocaust. Visit the Israel Museum, the Shrine of the Book, where the Dead Sea Scrolls are housed, and the model of Jerusalem as it was during the Second Temple period. Proceed to *Bethlehem, birthplace of Jesus; visit Shepherds’ field and walk through Manger Square to visit the remarkable Church of the Nativity. Return to Jerusalem. Drive through the Judean hills to the Qumran caves, where the Dead Sea Scrolls were found. Continue along the shores of the Dead Sea to Masada, the last stronghold of the Jews after the destruction of the Second Temple in 70 A.D. Ascend Masada by cable car and tour the mountain fortress built by King Herod; visit the remains of the walls, water cistern, and Herod’s Palace; descend by cable car. Continue to the Dead Sea, the lowest point on earth. Enjoy the opportunity to float in the buoyant water and cover yourself with the mineral rich mud, believed to have therapeutic effects. Depart Jerusalem through the Jordan Valley to Beit Shean; visit the newly excavated Roman city and amphitheatre. 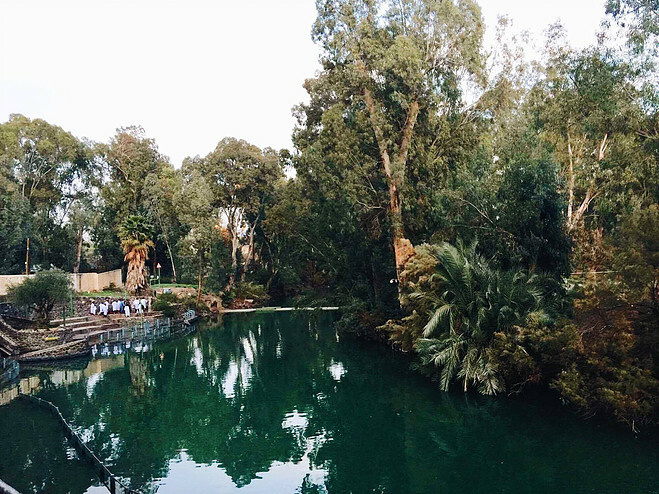 Proceed to Yardenit, the baptismal site on the Jordan River. Continue to Nazareth and visit the Church of Annunciation, Joseph’s Workshop and Mary’s Well. Next, drive to Cana to visit the Wedding Church, where Jesus performed his first miracle turning water into wine. Drive to Kibbutz Lavi for overnight. After a short tour of Tiberias, enjoy a boat ride on the Sea of Galilee; visit the Yigal Alon center where the “Jesus Boat”, an ancient fishing boat from the 1st century, is displayed. Continue to Capernaum to visit the remains of the 2nd century synagogue. Stop at Tabgha, the site of the Miracle of the Fish and Loaves, and visit the Church of Multiplication with its 4th century mosaic floor. Proceed to Mount of Beatitudes, the place where Jesus delivered the Sermon on the Mount. Drive to the Banias Springs and tour the Golan Heights. 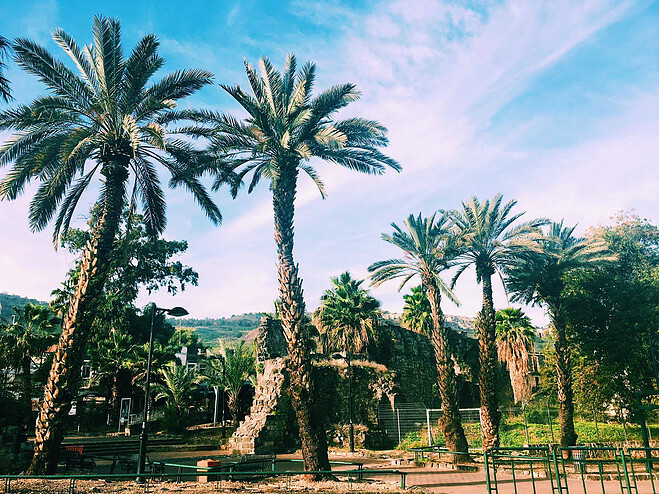 Depart Kibbutz Lavi and drive to Acre to visit the remarkable underground Crusader city and crypt: Walk through the Old City recognized by UNESCO as a world heritage site , the local market and harbor. Continue to Megiddo, identified as the site of Armageddon; learn the impressive history of this battle field as you visit the archaeological excavations including the well-preserved water supply system. Drive to Muhraka, the site of confrontation between Elijah and the prophets of Baal; enjoy the spectacular view of the Jezreel valley and the Lower Galilee. Proceed to Caesarea, once the Roman capital of the region; visit the excavations of the ancient city, the Roman theatre and aqueduct. Drive along the coastal plain to Tel-Aviv for overnight. 7 night accommodation using hotel plan of your choice. 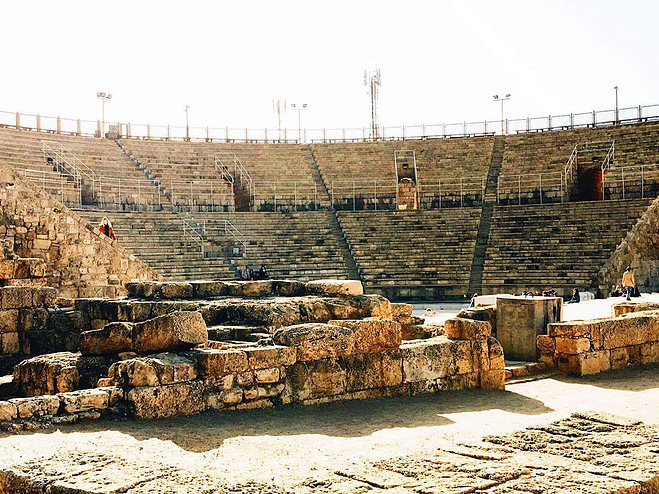 Depart Tel-Aviv and drive along the coastal plain to Caesarea, once the Roman capital of the region; visit the excavations of the ancient city, the Roman theatre, and aqueduct. Proceed to Muhraka, the site of confrontation between Elijah and the prophets of Baal; enjoy the spectacular view of the Jezreel valley and the Lower Galilee . Continue to Megiddo, identified as the site of Armageddon; learn the impressive history of this battle field as you visit the archaeological excavations including the well-preserved water supply system. 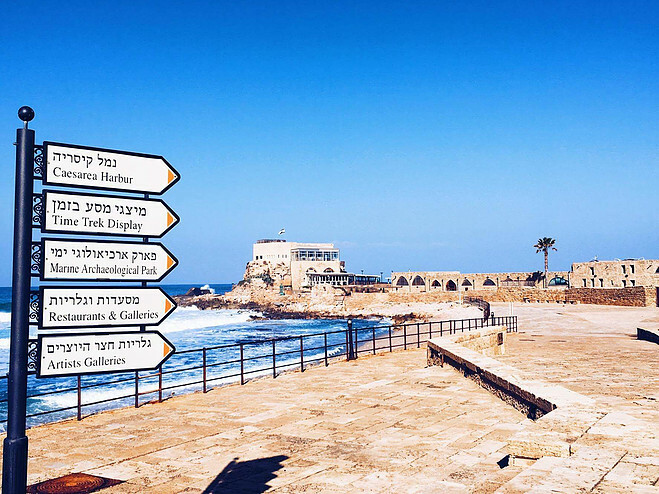 On to Acre to visit the remarkable underground Crusader city and crypt; walk through the Old City recognized by UNESCO as world heritage site , the local market, and harbor. Drive to Cana to visit the Wedding Church, where Jesus performed his first miracle turning water into wine. Continue to Nazareth to visit the Church of Annunciation, Joseph’s Workshop and Mary’s Well. Proceed to Yardenit, the baptismal site on the Jordan River. Next, stop at Beit Shean to visit the newly excavated Roman city and amphitheatre. Drive to Mount of Olives for a panoramic view of the city. 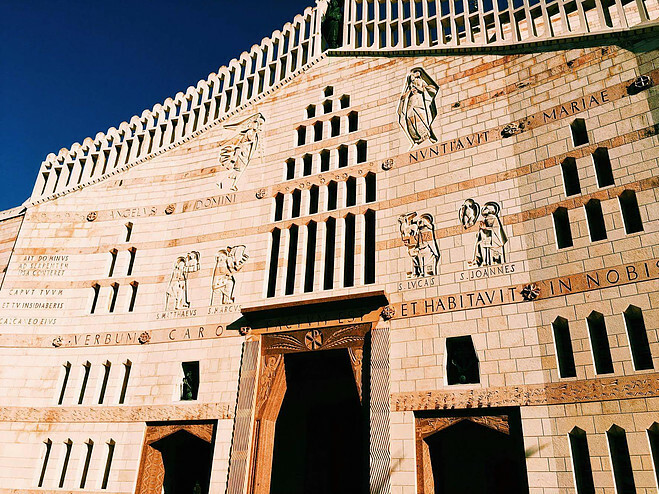 Visit the Church of All Nations, King David’s Tomb and the Room of Last Supper on Mt. Zion. Enter the Old City; walk through the Cardo, the ancient roman road; visit the Jewish and Christian quarters; view the Temple Mount; walk along the Via Dolorosa and the oriental Bazaar to visit the Church of the Holy Sepulchre. Next, drive to the Garden Tomb and enjoy the beautiful gardens and peaceful ambiance. Drive to Ein Karem to visit the Church of Visitation. Proceed to Yad Vashem, the memorial to the Holocaust. Visit the Israel Museum, the Shrine of the Book, where the Dead Sea Scrolls are housed, and the model of Jerusalem as it was during the Second Temple period. Proceed to *Bethlehem, birthplace of Jesus: Visit Shepherds’ field and walk through Manger Square to visit the remarkable Church of the Nativity. Return to Jerusalem. Drive through the Judean Desert to the Qumran caves, where the Dead Sea Scrolls were found. Continue along the shores of the Dead Sea to Masada, the last stronghold of the Jews after the destruction of the Second Temple in 70 A.D. Ascend Masada by cable car and tour the mountain fortress built by King Herod; visit the remains of the walls, water cistern and Herod’s Palace; descend by cable car. Continue to the Dead Sea, the lowest point on earth. Enjoy the opportunity to float in the buoyant water and cover yourself with the mineral rich mud, believed to have therapeutic effects.